As progress is made in conceptualizing how agriculture can better contribute to nutrition, extension and advisory systems are often listed as potential vehicles for realizing nutrition-sensitive agriculture. Yet many agriculture extension agents lack nutrition knowledge, and rarely interact with women farmers. 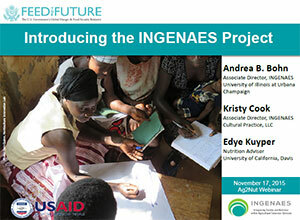 The INGENAES project endeavors to build the capacity of both public and private institutions engaged in agriculture extension to provide gender-responsive and nutrition-sensitive advising services to smallholder farmers, and to contribute to the evidence base by documenting experiences. The November Ag2Nut call included an overview of the project’s goals, its current and anticipated activities, Q&A and dialogue.